The Together Shuswap /Secwepemc workshop series is organized to facilitate dialogue and actions that improve the quality of life for Shuswap residents. The 2014 workshop was hosted by a partnership of Shuswap area organizations and communities. It was held at the Adams Lake Recreation and Conference Centre. It was facilitated by Donnella Sellars, Fraser Basin Council, and members of the Together Shuswap Steering Committee. The event brought together approximately 70 people from the Shuswap area. Delegates came from a variety of fields, with representation from First Nations, social and economic non-profit agencies, the education, business, government and health sectors, engaged citizens and others. 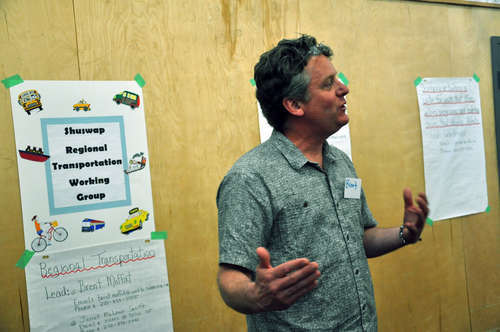 The hosts facilitated workshops, provided planning examples, organized presentations and highlighted the Shuswap Champion activities. Support multi-community, multi-government regional planning processes to build quality of life for all Shuswap residents. Engage in the processes to help build trust and co-operation in aboriginal and non-aboriginal communities. Learn about and get involved in the development of the projects and ideas championed in 2013. Download the Together Shuswap 2014 Report here. Contact Donnella Sellars for more information and the final report. The organizers would like to thank the Adam’s Lake Indian Band for generously donating space for the workshops at their beautiful conference center and Annie Michel (picture above) for providing the opening prayer. Together Shuswap / Secwepemc is a Learning Initiatives for Rural and Northern BC (LIRN BC) initiative. The Fraser Basin Council gratefully acknowledges the Real Estate Foundation of British Columbia for their financial support of the Smart Planning for Communities program.